Arhus Gint is employed as a translator by the World Council, a global governing organization based in Jerusalem which was created after a catastrophic war. His position gives him an inside view of the political machinations and personal reactions of the governing officials following the sudden arrival of aliens on our planet. 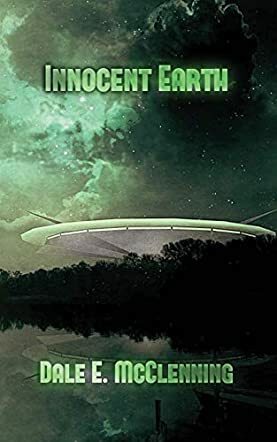 Innocent Earth by Dale E. McClenning describes the fallout following the arrival of god-like beings who announce they have ‘returned’ to claim their own. Methodically the aliens select thousands of individuals to accompany them back to their own planet, demonstrating almost invincible power against any who would try to interfere with the process. As individual nations take up a variety of positions on the matter, the council finds it increasingly difficult to formulate a coherent policy, a sensible response to the aliens’ activities. But as religious sects argue about the status of the new arrivals, some even declaring them to be God, and public order starts to deteriorate, Arhus finds himself, albeit reluctantly, at the very centre of events. Under pressure from the World Council and the many people wanting access to the aliens, can he rise above petty politics and gain some benefit for humankind from this unique situation? I enjoyed this novel. Innocent Earth explores a subject that has been visited by many prominent sci-fi authors over the years. How would the planet and its people react to the arrival of aliens and what would the aliens want? Dale McClenning has produced an original slant on the subject, choosing to concentrate his narrative on the personal reactions and political repercussions. There is some routine sci-fi description of the aliens and their craft, and there is some clever linking to biblical descriptions and events, but the main thrust is on the efforts of the individuals and politicians to come to terms with the situation. Intelligently observed and peopled with well-drawn, believable characters, the plot delivers an unusual perspective on a much-visited subject. A thought-provoking work and a welcome addition to the genre.